When infection with hepatitis C virus goes from acute to chronic, severe liver disease may occur which requires organ transplantation. Nearly 200 million people are chronically infected with HCV, necessitating approaches to preventing and treating infections. No HCV vaccine is available, and current antiviral therapy consists of administration of interferon plus ribavirin, a combination that is effective about half the time and is associated with undesirable side effects. New antiviral compounds that target a viral protease and RNA polymerase are currently in clinical trials may eventually reach the market. But our experience with HIV-1 has shown that combinations of three drugs are the most effective for derailing the emergences of drug resistant viruses. 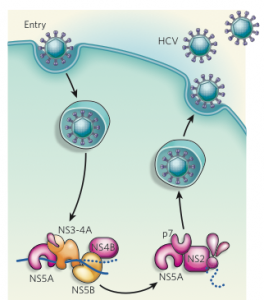 The third target for HCV could be NS5A, a viral protein without a known function. To identify new inhibitors of HCV, a chemical library of one million compounds was screened for the ability to inhibit viral replication in cell culture. The active compound were then subjected to a second screen to eliminate inhibitors of known viral enzymes: the viral protease, RNA polymerase, and helicase. One of the remaining inhibitors was further refined chemically until a very potent derivative was obtained. This molecule, called BMS-790052, has a 50% inhibitory concentration in the picomolar range, and inhibits all the viral genotypes tested. It is the most powerful inhibitor of HCV discovered. The compound was tested for safety and bioavailability in various animal species. After oral administration, the compound was found in plasma and liver, despite a molecular mass of over 700 daltons. Six different levels of the compound were tested in HCV infected individuals. No adverse effects were reported, and the highest amount administered reduced viral levels in the blood 2,000 fold after one day. These results are promising, but larger trials will now be needed to further confirm the safety and efficacy of the drug. What is the target of BMS-790052? Two lines of evidence suggest that the compound inhibits the viral protein NS5A. The drug appears to bind NS5A, and viruses resistant to the drug have amino acid changes in this protein. Although NS5A is known to be required for viral replication, its precise function is not known. Because NS5A does not have an easily assayable enzymatic function, it has not previously been a target of drug discovery. The identification of a compound that inhibits NS5A function is an important step forward in HCV drug development. The general approach used to discover BMS-790052 should be useful in identifying inhibitors of other viral proteins that do not have well defined and measurable activities. I discussed this paper on Futures in Biotech episode #60. If you would like to listen only to the conversation about BMS-790052, download this mp3 file, or listen to the discussion below. This is the tough one. a hepa without cure. “Today, most people become infected with the Hepatitis C virus by sharing needles or other equipment to inject drugs. Before 1992, when widespread screening of the blood supply began in the United States, Hepatitis C was also commonly spread through blood transfusions and organ transplants. with over 50 subtypes. A few amino acids change of HCV can cause drug resistant.